In January 2012 we visited Namibia. We had planned to travel across the Northern part of the country to look for trees and insects. This report is only concerned with the Acacias. 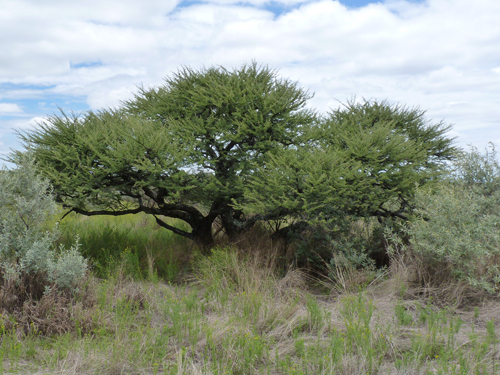 I will use the old scientific names for the Acacia trees, that means Acacia s.l. (s.l.= sensu lato), because the Africans have not yet adopted the new genera Vachellia (straight thorns) and Aculeiferum (hooked thorns). 1240m; S 22º 10 '086"; E 16º 18' 087" at the Northern border of the Khomas Hochland. Near the lodge complex is one of the typical Namibian Rivier, a dry river, that only sporadically has flowing water, when it drains the scarce rains. It is bordered by huge Acacia erioloba (Camel thorn) and Faidherbia albida (Ana tree, formely Acacia albida), which get their water from the deeper zones of the river bed. They both carried big fresh fruit: The young boat shaped pods of A. erioloba did not yet show the characteristic grey, and the reddish-brown spirally contorted to sickle-shaped pod of F. albida - known in German as “Apfelschalen-Akazie“ was gleaming against a blue sky. On the rocky slopes Acacia senegal was in full bloom, showing its bushy white flower spikes, old as well as new fruit and the three hook-thorns, that characterize it. Also still blooming on the reddish twigs was Acacia reficiens, a close relative of A. luederitzii. 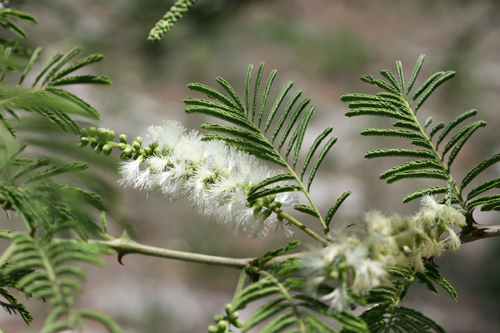 Acacia erubescens already had finished flowering and featured fresh green, thin legumes. 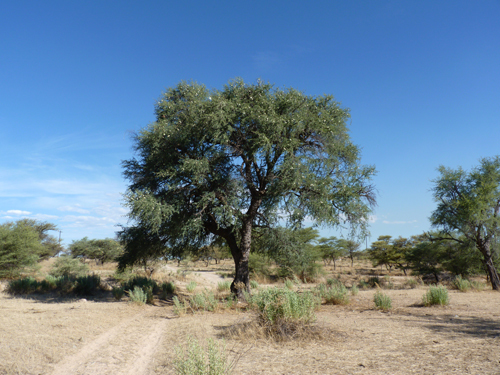 There were also Acacia mellifera bushes and some Acacia tortilis and Acacia karroo trees. The relatively new lodge is nestled among the red rocks of the Erongo mountains at their Northwestern edge. 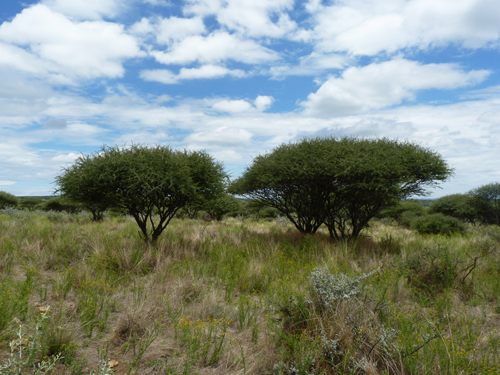 In the flat areas we found Acacia bushes, mainly fruiting A. erubescens, A. mellifera and blooming A. reficiens. On the lodge trail there was A. karroo. It is a working cattle farm near the “Fingerklippe”-rock not far from Khorixas. The farm house borders the Ugab, another river that is dry most of the year. 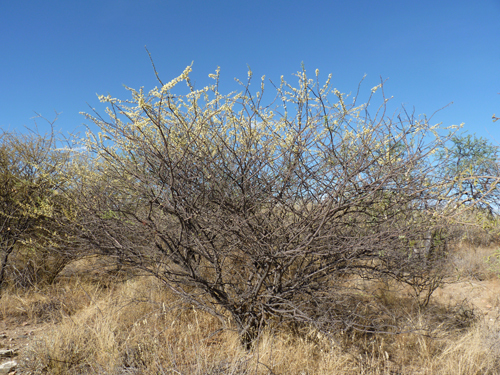 Accordingly big A. erioloba and F. albida trees provided shade for the cattle, while the temperature rose above 40o C . In the rocky hills the most abundant Acacia was A. senegal again in full bloom. In the area we also found A. nilotica with its long thin white stipular spines slightly bent backwards. Most telling are the long beans restricted between the seeds. A. nilotica is widespread throughout Africa and Asia till India. The pods are quite variable according to the location. On our way to Rundu we stopped south of the "Meat border", approximately at S 18 53 40.16, E 18 52 11.90. There we found blooming A. luederitzii as well as A. fleckii, which is difficult to differentiate from A. erubescens and A. senegal. Again a list of parameters is shown, which help to determine the species. There were also some African wattles ( Peltophorum africanum) showing small fesh fruit. E 19 39 50.89, where we attended a nice Sundowner boat trip on the Kavango river and left next morning. No special sightings of Acacias. Now we had reached the area, which was the main goal of our holidays: the Caprivi strip, forming for more than 400 km the National border to Angola and later to Sambia. The vegetation is quite different from the savanna further south. Acacias are not any longer the dominant tree. At Divundu, the Kavango sharply changes ist direction, running now straight southwards into Botswana, where it forms the Okavango-Delta and disappears into the Kalahari sands. The Divava Lodge is located on a ridge above the river not far from Divundu, a locality of 500 people. Coordinates: 1009m, S 18 06 42.90, E 21 33 35.74. 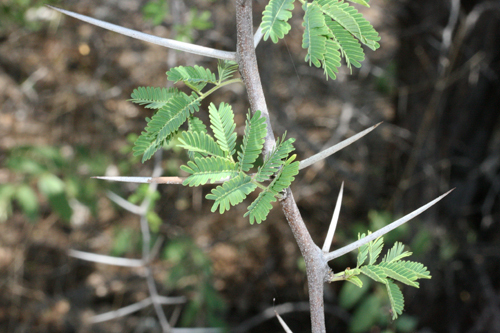 At the riverside we found the huge Knob-thorns, Acacia nigrescens. The trees can grow up to 25-30m height. On their stems they form thick woody knobs, crowned with a black hook thorn. Their leaves resemble those of A. mellifera, only that A. nigrescens shows more and bigger leaflets. We found abundant fruit from last year still hanging on the tree. In the nearby Mahango National Park the majestic Baobabs stand next to the tall Acacia nigrescens. Tree species there reminded us of the Limpopo province in SE South Africa, which lies appr. 900km southeastward. 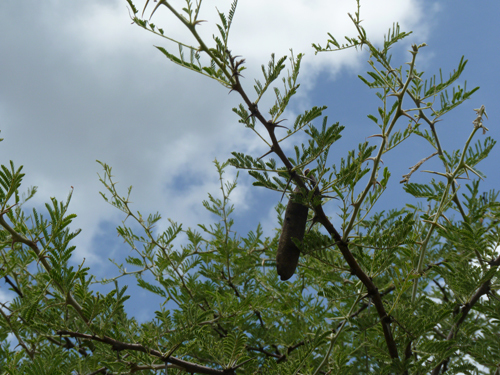 In the area we found one new taxon: Acacia hebeclada ssp. tristis. In contrast to A. hebeclada ssp. hebeclada (Candle thorn) the fruit does not stand upright, but it hangs down like in most other Aacia species. But the leaves and the combination of long and straight thorns with a slightly arched tip as well as short and somewhat curved thorns on the same twig show its relation. 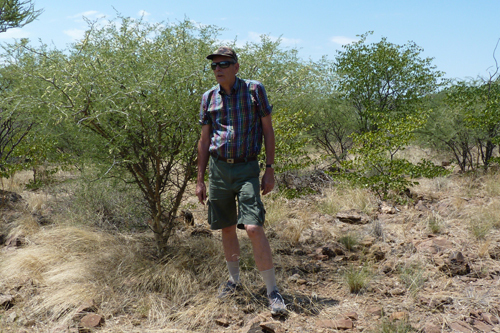 Unfortunately we did not find the Sand acacia, A. arenaria. Where the elefants freely roam, we saw young shoots of A. erioloba, the seeds having passed their digestion system. We then returned to the more central part of Namibia to the Waterberg Plateau Lodge, Coordinates: 1516m, S 20 48 520, E 17 29 866. 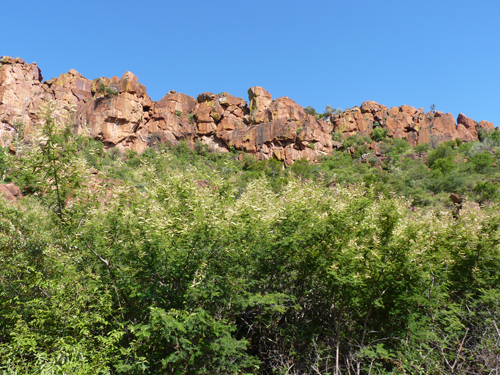 As in former times we found big thickets of the climbing Acacia ataxacantha in full bloom at this time (19.1.12) of the year. 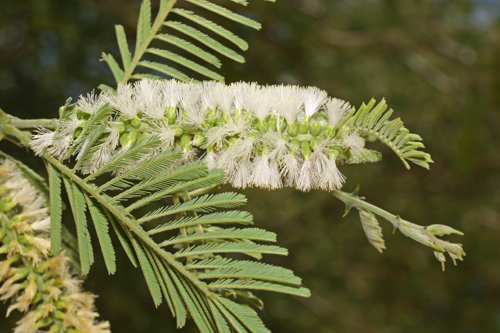 Acacia fleckii was also blooming, showing nearly the same whitish flower spikes as A. ataxacantha. 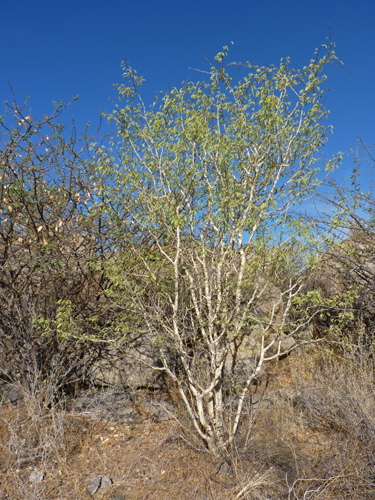 But A. ataxacantha is clearly differentiated by its prickles scattered along the twigs. A. luederitzii attracted with its flowers many insects, e.g. the beautiful rose beetles. Some trees had already formed small, green pods. 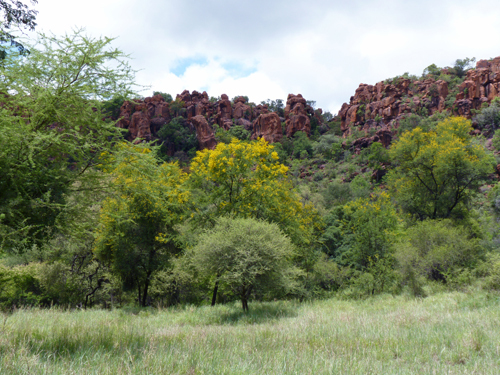 Contrasting with the red rocks of the Waterberg were yellow “Flower trees”, Acacia karroo, painting the landscape. We did not find A. tortilis ssp. 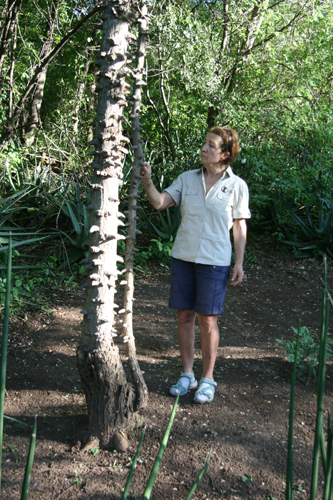 spirocarpa, which has its Southwestern distribution limit on the Waterberg. I do show a photo of this species under Ethiopia. 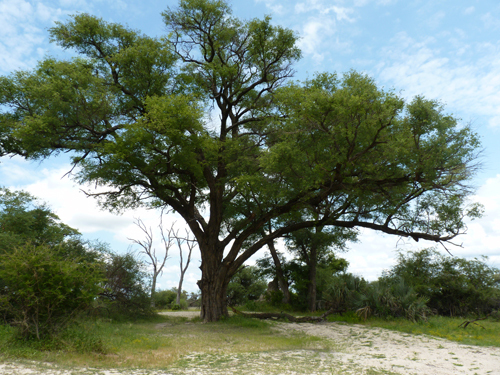 Near the dry river bed we saw again tall Acacia karroo trees, some in bloom, only not as spectacular as in Waterberg. 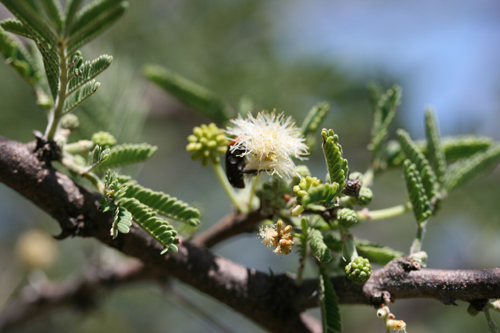 The predominant species there was Acacia mellifera ssp. detinens. It covers large parts of the farm. In some areas hundreds of the bushes had died. 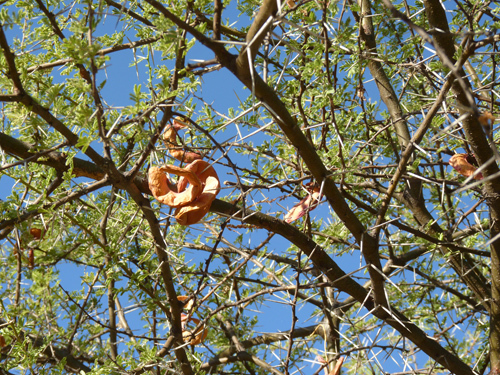 This may be due to the excessive rains in 2011 (and again in January 2012): There was abundant surface water which may have favored a fungus, that killed the acacias. We also found A. erioloba and A. hebeclada. We were fortunate to see so many Acacias in full bloom: A. senegal, A. fleckii, A. ataxacantha, A. reficiens, A. luederitzii and A. karroo.